For much of my life, I’ve found myself pretending to be perfect. I care so much about what people think about me, where it bothers me when people don’t think that I’m (cool, fun, smart, nice, insert good thing here). It’s simply a part of the human (*after the fall*) condition: we are insecure about how we are perceived because we don’t completely trust that God and others love us and want what’s best for us. So I have found myself putting on a face, faking that everything’s alright when it’s not. I’d imagine that everyone reading this can relate. Our world is pro at this, especially with social media like Facebook and Instagram: we put up our best, happiest pictures for the world to see. And then what happens? Everyone looks at those pictures from their bedroom all alone or something and gets jealous thinking that they’re a loser because they aren’t experiencing all of the crazy stuff that their friends are. In life we go through a boatload of stuff. Good and bad, happy and sad, exciting and depressing. What keeps you centered through it all? Is what keeps you centered going to constantly be there for you? Does it help both in good times and in bad? What keeps me centered through all the bumps in the road is my faith in Jesus Christ. Jesus is always there for us, even when it’s hard to just have faith in the first place. I love and appreciate the support of my family and friends, but they simply can’t be there for me in the most intimate ways that I need it. It’s one thing to calm someone who is crying. It’s a radically different thing to give peace to a soul. True intimacy not only allows us to share our bodies, as we are accustomed to thinking of it, but also our emotions, fears, hopes, dreams, struggles. If we are holding things back, then we are not being truly intimate (quick stereotypical Catholic thought: apply that to contraception.. (light bulbs, anyone?)). And only our God, who created each of us uniquely, can truly understand us and accept us completely as we are. You know, there are probably times when we are all tempted to think that. If everything is going well, if we seem to be in a good place and are living an exciting life, why would we want anything more? But if we come to realize that even in our greatest triumphs, our most ecstatic joys, there is still a part of us that is crying out for more. These moments are oh so familiar for those who are poor, spiritually broken, alone, needy, sick, and mourning. Our souls are longing in these moments for complete and total love. For security and fulfillment. Something that this world cannot give. As for the relevance of Christianity: it is only as relevant as its God. And our Lord Jesus Christ, the bridegroom to each of our souls, is exactly what we need. 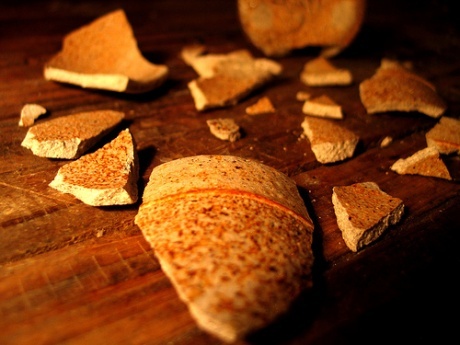 We are like broken pots, busy trying to hide our imperfections from each other, afraid that someone might notice. We have two options. We can stay all by ourselves, continuing to try and live a lie of our own self-fulfillment, or we can call out to the master potter, who will hastily come to us, pick up each of our pieces, and put us back together good as new. This Christmas marks the coming of Jesus Christ into the world to do just that. He came so that He can help us become the children of God that He created us to be. All that we need to do is call out, and He will be with us to help heal our brokenness. Here’s a prayer that maybe you can join me in praying this Advent: Lord Jesus, I need you. I am broken and in need of your help to heal my body, soul, emotions, and all. Please come and heal my faith, help me to believe in and know you with great conviction. Give me a strong hope to get through the difficult times of life. Give me a strong love for the people in my life, especially those in need. Help me to see you in the poor, the suffering, the needy. Come into my life and renew me, make me your own creation. Amen. This entry was posted in God and tagged acceptance, Bible, Brokenness, Catholic, Christian, Depression, Despair, Emotion, faith, God, Hope, Intimacy, Jesus, Loss, Love, Optimism, Perception, Popularity, Prayer, Sorrow by Chris. Bookmark the permalink.